A plan permission is the ability to perform a particular operation on a plan and its jobs. For each plan, different permissions can be granted to particular groups and/or users. People who have the 'Admin' global permission can 'bulk edit' permissions for multiple plans at the same time, as described below. Note that this will overwrite any pre-existing plan permissions. People who have the 'Admin' plan permission for one or more plans, but do not have the 'Admin' global permission, can only edit one plan at a time, as described in Configuring a plan's permissions. Note that it is recommended that you grant permissions to groups rather than to individual users. 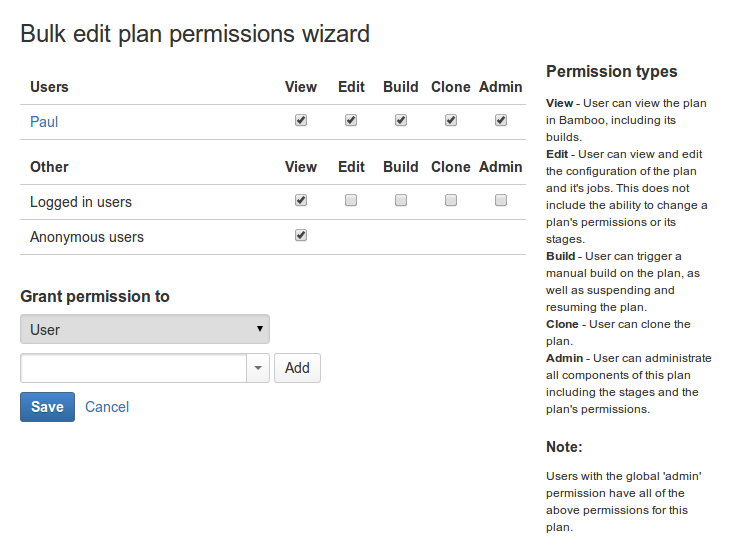 In the Plans section of left navigation panel, click Bulk Edit Plan Permissions. Select the plans whose permissions you wish to edit, then click Next (at the bottom of the screen). Select the check box for each permission that you wish to grant to the user or group.